While the famous iPhone doesn’t offer storage expansion, just about every other smartphone on the market support microSDHC cards. SanDisk recently sent us a 16GB microSDHC card. Although there was only about 14.8GB of usable space due to formatting, it’s still remarkable how small flash memory has become. This specific model is now even included with popular phones such as the BlackBerry Storm2 and the Motorola Droid. At the moment this is the largest capacity available, however 32GB microSDHC cards are supposedly just around the corner. The second item SanDisk sent us was the MobileMate Duo, a MobileMate Micro USB card reader and a SanDisk SD card adapter for microSD cards. Although most modern gadgets should allow a mass storage mode to allow copying data over, the MobileMate Duo kit offers direct access to the microSD card. The USB card reader worked right out of the box on Windows 7 and OS X Snow Leopard. No extra drivers were needed. Using the SD card reader adapter is self-explanatory. Just as a popular SD cards revolutionized flash storage for Digital Cameras, the microSDHC cards are doing the same for mobile phones. These are affordable, easy to carry, and swappable on most devices. 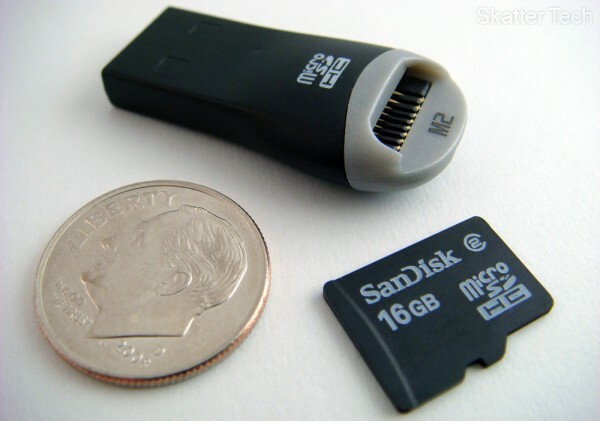 SanDisk, a reliable brand, is producing quality products. The read and write speeds were higher than I had expected for such a small piece of flash media. This card is a excellent way to store music and photos on mobile devices. The USB adapter is a great accessory if your device won’t allow direct syncing. Although the MSRP is ridiculously high, priced at $109, it’s available for a fraction of that if you shop around. The 16GB model goes for around $45 on Amazon.